Ambassador John Bernhard is a PGS Senior Associate and has served in the Danish Ministry of Foreign Affairs as an Adviser on International Law (1979-1989), Undersecretary for Administrative and Consular Affairs (1991-1994), Ambassador and Permanent Representative of Denmark to the IAEA (2005-2011), Member of the IAEA Board of Governors (2009-2011), Vice-Chairman of the IAEA Board (2010-2011), and an Agent of the Danish Government in cases before the International Court of Justice and the European Court of Human Rights. He has held Ambassadorial posts in Venezuela, Spain, the Netherlands, and Austria and has been involved in the United Nations, the Organization for Security and Cooperation for Europe (OSCE), the European Union (EU), and the Council of Europe. Ambassador Bernhard has also taught International Law and EU Law at the University of Copenhagen and has written textbooks for the university on international law and human rights. He holds a B.Sc. in Spanish and a M.Sc. in Law. 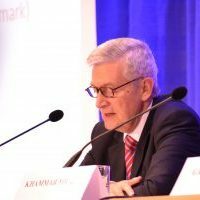 After thirty-seven years of diplomatic career in the Danish Foreign Service (1974-2011), Ambassador Bernhard retired and is now an international adviser on a freelance basis.